Just spend a couple of minute you will be reached various interesting place where you wish such as Royal palace, National Museum, Monument Independent, Toul Sleng, Russian Market as well as Business Center District. Our boutique hotel is strategically located in the heart of Phnom Penh City. The Star Wood Boutique Inn is a perfect accommodation, whether you are exploring the Cambodian rich culture or seeking a safe heaven for business. 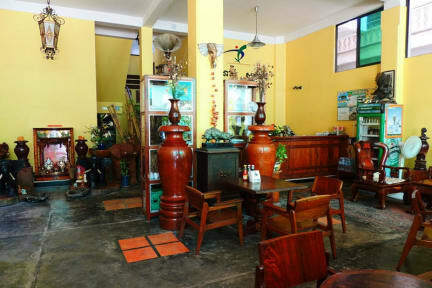 This is the best budget boutique hotel in Phnom Penh city where you need not to shop further. It is a newest boutique Inn in the Phnom Penh Capital which built and designed by our Cambodian Architecture. Lage ist ganz ok. Angemessene Zimmer. Mit Ventilator auch nicht zu warm (Ende Mai). Personal sehr freundlich und hilfsbereit. Hotel ist zu empfehlen. Clean room but location is a bit far from the main tourist attractions and the backpacker area. It is roughly a 30-40 mins walk to the attractions etc. It is average for the price for backpackers and no social atmosphere in case you are looking for that. The room was alright, nothing special, but good if you stay for one night. If you travel alone I wouldn't recommend this hotel, as it's difficult to meet other people.